In this, the penultimate installment in our series discussing the consequences of volume on music, sound and human ears, we look at tools for measuring loudness. 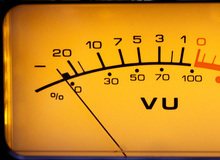 Business is business, and with loudness issues front and center in the last few years, software makers seized the opportunity to introduce new tools to measure and correct loudness issues (taking into consideration the new standards we discussed in the last article). Others have integrated such tools directly in an already existing product via an update or upgrade. This is by no means and exhaustive list (it's impossible to know all available products at any given time), but I'll mention the main measuring and/or correcting tools as of this day, both paid and free. Owners of iZotope products are really spoiled in this regard, as long as you have one of the most powerful, and thus expensive, versions of their software. For example, RX4 Advanced ($1199) includes a Loudness module that allows you to analyze and then correct audio files according to different standards, thanks to the included presets (EBU R128, ITU-BS.1170 rev. 1, 2 and 3, ATSC A85, the US variant, OP-59 for Australia, etc.). You can manually set the True Peak limiter and the LUFS level (iZotope uses LKFS, which is identical to LUFS). 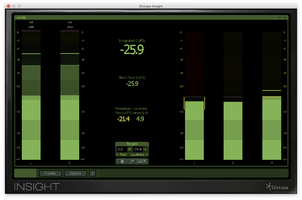 For its part, Ozone 6 Advanced ($999) provides the Insight metering suite (available separately for $499). It includes an array of comprehensive metering tools adhering to the new standards (plus the typical Peak and RMS meters, of course), with a Loudness history graph. It doesn't include any options to correct anything with dedicated modules or processors, though. Flux : has the Pure Analyzer System ($399), to which you can add the Metering option ($199). It allows you to measure, but not to correct anything. 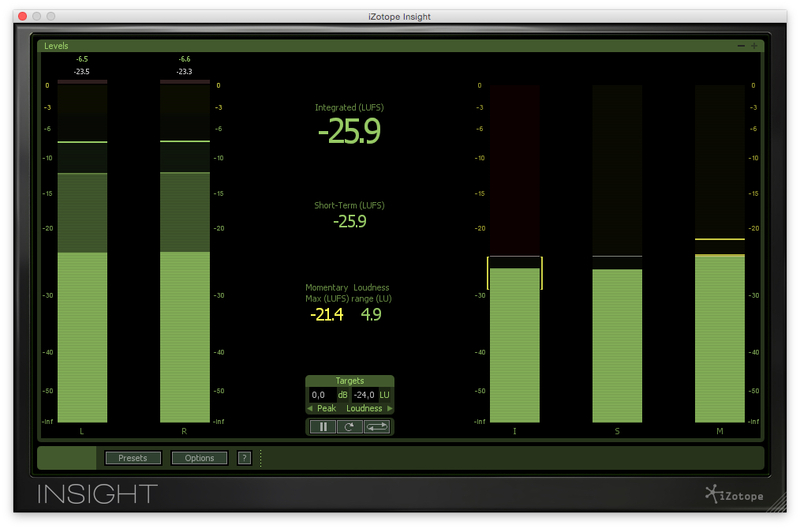 MeterPlugs offers the LCAST, a very comprehensive stereo ($199) or surround ($399) metering tool. No correction possibilities either. I haven't tried it out so can't say much more about it. For metering purposes, I'd also recommend the Hofa-Plugins tools, especially the 4U series, which is free. Noteworthy is the Hofa 4U Meter, Fader & MS-Pan for its EBU R128 display functions. Granted, it's limited, but it's free. It's a good way to get acquainted with the new measuring standards and get used to the new indicators. ToneBoosters offers the EBU Loudness for €19.95. It provides metering modes for all standards, including the K-System v2, True Peak, and Loudness history, plus stereo and multi-channel modes. It's the least expensive of all the series, but provides several advantages, especially thanks to the presets available and the indicators of when the gates are activated (see the standard's technical documentation). 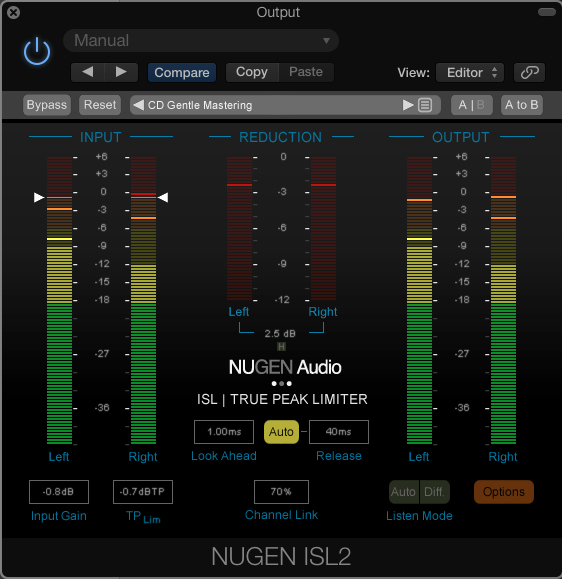 NuGen, well-known for the Visualizer which provides almost all possible metering options (currently in version 2), has a very comprehensive array of tools dedicated to measuring and correcting audio in compliance to the current standards. The LM-Correct ($399) is a standalone software to analyze and correct any audio file (according to one of the standards integrated as presets, and with the possibility to adjust the set values). A true must have if you need to produce different types of media. The ISL2 ($249) is a true peak limiter that allows you to use readily available presets complying to the standards. MasterCheck ($129) allows you to instantly verify how your audio tracks will sound with the different standards, thanks to the Offset To Match function, including the PLR meter (Peak to Loudness Ratio, in other words, the difference between peaks and perceived volume). VisLM2 ($449) is a very comprehensive set of meters, with history display and the possibility to export statistics. 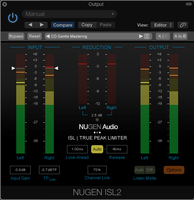 NuGen also provides bundle ─ the Loudness Toolkit 2 ─ that includes the ISL2, LMCorrect2 and VisLM2 ($949). It's obvious however that the price of these tools aren't within the reach of everybody. Finally, TC Electronic (recently bought by the Music Group, i.e. 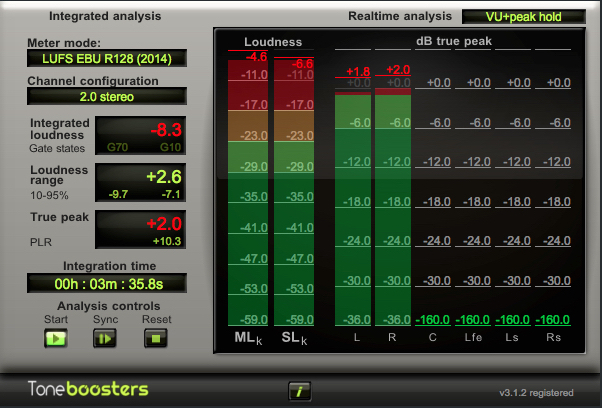 Behringer) has the LCn Loudness Correct app series. The apps serve to analyze and process .aif and .wav files according to a certain number of presets, with level controls complying to LUFS and dBTP. There are two version, the LC2n (for stereo files, $299) and the LC6n (for surround work, $699). A must have, like the NuGen LM-Correct. And since both cost about the same, your choice will be a matter of taste. Do note that TC also offers versions without correction facilities, the LM (2 and 6) and LMn (1, 2 and 6). Given the price of some software tools, you shouldn't buy them on impulse. First think about the utility and return on investment of the software in question. Knowing the impact of the new standards on your own productions will be a plus and can eventually lead to a change of your personal mixing practices, rediscovering dynamics. The low-cost (but not cheap) options listed here might prove very useful. Despite all this, you shouldn't get your hopes high. These new standards haven't been widely adopted yet, since there are no legal obligations right now. It can be a while before all sites (the main music providers nowadays) decide to comply voluntarily. And there are no guarantees that those that do have to abide to them actually do (it's very easy to verify how many live event promoters, DJs, bar and disco owners, and concert halls can reach up to 105dB). Remember there is no correlation between the volume of a song or an album and its commercial success, as Earl Vickers demonstrated during the 129th AES convention! It's time for me to conclude...for the time being. Imagine that all stakeholders in the Loudness Wars decide to stop this craziness once and for all. Musicians, producers, sound and mastering engineers, record labels, radio and TV stations, post-production mixers, Internet sites, journalists (yes, they are also partly responsible), remixers, event promoters, DJs, ad agencies...Imagine they were all to accept their mistakes and the damage they've caused to music, sound and our ears! ─ nice dream. Commercial pressure is the only thing that will make things change, as usual. There is some of that already, but there's still much left to do. In the meantime, what's important is to get the message out: The problem isn't limited to how bad music sounds or not, it's actually much bigger than that ─ it's a problem of public health.